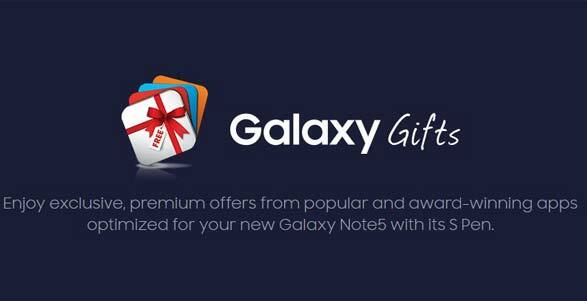 Samsung has just announced a large selection of freebies for Galaxy Note 5 buyers, called “Galaxy Gifts”. The Galaxy Gifts’ are generally an additional bonus that Samsung bundles with their high-end devices, so that you can add additional value to the package with some free and also discounted stuff from its partners. ArtRage: ArtRage gives you a packed toolbox of natural painting tools like oils and watercolors that let Note5 users release their inner artist, free of charge. They can smear thick oils under a stylus, blend watercolors, and sketch with pencils that show the texture of the canvas beneath. Driver Speedboat Paradise: For all users of Galaxy Apps on the Samsung Galaxy Note5, a speedboat is offered to drive in Ubisoft’s game: Driver Speedboat Paradise. Empire: Four Kingdoms: Build, trade and conquer in a world with millions of players. In this mobile app, your strategy determines whether you become a legendary king or remain a simple peasant. All Samsung Galaxy users will receive an exclusive in-game gift after downloading the game. Hearthstone®: Heroes of Warcraft™: Users will be rewarded with three free Classic card packs and a shiny Galaxy Gifts card back designed for Galaxy owners. Deceptively simple and insanely fun, Hearthstone®: Heroes of Warcraft™ is Blizzard Entertainment’s acclaimed free-to-play strategy card game for everyone. Komoot: Komoot allows Samsung owners to enjoy free turn-by-turn voice navigation and offline topographic maps, even in the woods. Hike, cycle, mountain bike, and engage in other sporty outdoor adventures while this award-winning app guides users to their destination with ease. Lifesum: Lifesum is a personalized guide that makes achieving lifestyle goals easier and faster. Users take small, manageable steps, find motivation, become more intentional with eating and exercise habits, develop discipline, and discover how seemingly insignificant choices made daily lead to big changes long-term. Users will achieve their goals with six months free Gold subscription which includes personalized guides to dieting, exercise, and more. NY Times – Latest News: The New York Times app features award-winning journalism on the Galaxy Note5 high-resolution screen. Note5 users can enjoy the first six months free with subscription (three months for U.S. and Canada). OneDrive: Galaxy Note5 customers receive an exclusive offer from Microsoft OneDrive. They will receive an additional 100GB of storage for two years for free. With OneDrive, these customers can automatically upload photos they take with their Note5. They’ll have enough space for 38,000 images and can easily view and share them from any of their devices. Scribd: Scribd offers unlimited and instant access to over one million books, audiobooks and comics, and the ultimate editorially curated and personalized discovery experience. Users will receive three months of unlimited access (valued at $27) to a library of one million ebooks and audiobooks. SketchBook for Galaxy: The special edition of Autodesk SketchBook exclusively customized for Galaxy Gifts provides Samsung Galaxy Note5 customers with professional-grade painting and drawing software and fully unlocked Pro features for free. The Economist: The Economist is your weekly essential global briefing on business, finance, economics, science, technology and the arts offering independent commentary and analysis. Galaxy Note5 users can enjoy six months, full digital access, free trial. The Guardian: Users receive six months free access to the ad-free, premium Guardian app ($3.99 per month). Samsung users will have access to premium content, crosswords and ad free experience. TripAdvisor: For Samsung device owners only, the TripAdvisor App provides 15 percent discount coupon and exclusive features, helping users plan and book the perfect trip. Needless to say, many of these free gifts will be more useful to certain people than others. As an example, the 100GB of free Microsoft OneDrive cloud storage may very well appeal to some customers, as well as a several individuals news subscriptions; however unless of course you are a enthusiast of Driver Speedboat Paradise, the offer of a free of charge speedboat for playing in the game is going to be of little use. To benefit from the actual package offers, Samsung says customers need to just “download the [Galaxy Gifts] application through their Galaxy Note 5.